On 28th November, we held our Annual Dinner at the Westbury Hotel, Dublin, sponsored by the Arthur Cox and OpenJaw Technologies. 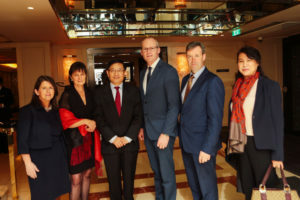 This event was the highlight of what has been a busy and productive year for the ICBA, and eagerly anticipated with the attendance of An Tánasite, Mr Simon Coveney, Mr Michael D’Arcy, T.D., Minister of State at the Department of Finance and the Department of Public Expenditure and H.E. Dr Yue Xiaoyong, Chinese Ambassador to Ireland, as well as over 160 members, colleagues and friends. As H.E. 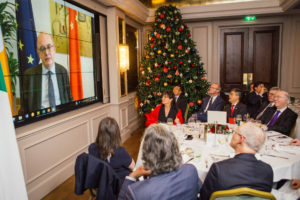 Eoin O’Leary, Irish Ambassador to the People’s Republic of China could not attend in person, he very kindly addressed our guests via video link. 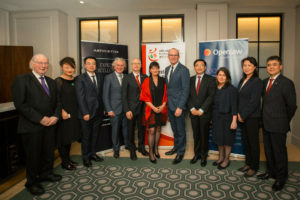 The evening was a terrific success and would not have been possible without the support of our sponsors Arthur Cox and OpenJaw Technologies and of course, our MC Terence O’Rourke, Chairman of Enterprise Ireland. Thank you also to all the staff at The Westbury who were exemplary as always.